By any standards, Terry Fox was amazing. By Canada’s standards, he is a hero. This active young man from Canada’s west coast was diagnosed with bone cancer when he was 18 years old. 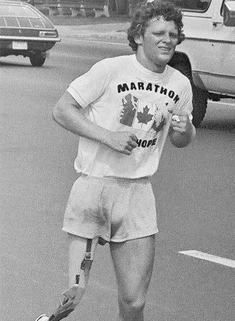 After having his right leg amputated above the knee in 1977, Terry wanted to do something to help the many people in our country who suffer from this disease. He set about to raise money for cancer research by running across the country as part of his “Marathon of Hope.” Sadly, after running for 143 days and over 5,000 km, Terry had to stop his marathon when the cancer spread to his lungs. He died on June 28th, 1981 at the age of 22. Terry’s legacy continues when every year in September people young and old gather for the Terry Fox Run to raise money for cancer research. Terry Fox is indeed a Canadian hero. Have students work in small groups to draw a picture of a hero. Share with the class. How many included a cape, a power symbol, or other fantasy elements? Ask students whether they thinkreal-life heroes look like this. Explain that heroes are also people like Terry Fox who do something special to make the world a better place. Ask who they think are the heroes in your community. Sometimes our concept of heroes is based on media hype, word of mouth, sensationalism, or something other than facts. What do you think distinguishes a real hero? Write a poem, short story, or blog about someone (real or imaginary) that you think is a hero. Be prepared to explain why you selected this person and what they do to make the world a better place. For more information and lesson plans related to Terry Fox, check out the Terry Fox Foundation.